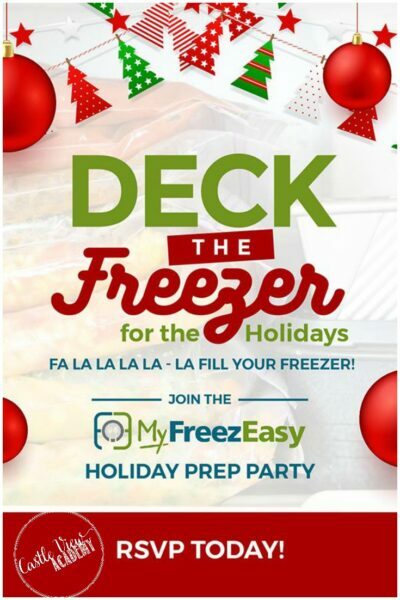 Home » Holidays » Christmas » Deck the Freezer for the Holidays November 1-5 – Will You Join Me? 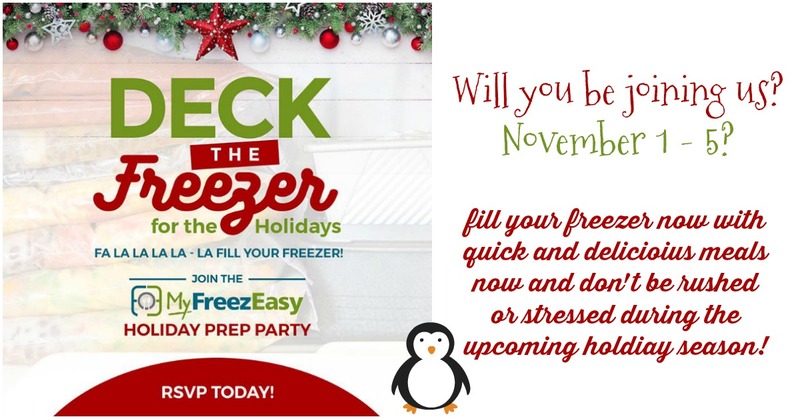 Deck the Freezer for the Holidays November 1-5 – Will You Join Me? November and December are always so busy with Thanksgiving-Chanuka-Solstice-Christmas-Kwanzaa-NewYears, events, gift shopping, decorating, etc. and time (and energy) are on short supply. One way to ensure you get time for great meals is to fill your freezer ahead of time with homemade goodness! Join me for Deck The Freezer and get ahead of the holiday bustle! You may know that each month I make freezer meals (cook for the freezer) so that we always have something on hand for busy days – either for the slow cooker if we’re organised and plan ahead – or to throw in the skillet at the last minute. It’s a wonderful feeling to just be able to grab something out of the freezer, cook it up with ease, and add a side or two of veggies and be good to go! This year I’ve fallen so far behind in so many ways – but I’m heading (slowly) back to the straight and narrow track. I don’t want to be stressed this year when December rolls around so right now is the perfect time to fill the freezer with delicious meals prepared ahead of time…and your cost to join..is … FREE! Join in by clicking here and signing up. You’ll receive an email with the recipes to download, as well as the shopping lists, and assembly instructions to make your meals a snap to prepare in record time (have you seen our review of MyFreezEasy where we make 10 meals in an hour – I still use this monthly). Who can resist FREE recipes and a new way to learn to cook in short time? Now’s the time for it! Check out the meal plan, decide which recipes you will make, check your cupboards and list the ingredients you will need. Purchase them and then cook the following day so you’re fresh and not feeling too tired from shopping. Have a cup of tea/coffee/juice/water/drink of choice ready nearby so you stay in your groove. Be sure to mark/label your holiday meals as such so they aren’t consumed ahead of time! That would only leave you right back where you are now. Of course, if you’re extra-motivated, you can make more of these recipes, or sign up for MyFreezEasy and have access to new monthly meal plans at your fingertips anytime you want them (I love the app)! If you’re worried about over-indulging during the festive season, then the Intentional Bites Planner may be for you to help you be more intentional about what you eat. It’s also the perfect place to plan your December meals (and 2019, too! ); you can read our review here. Will you be joining me? Let me know, and we can have some fun together! Click here to sign up now!